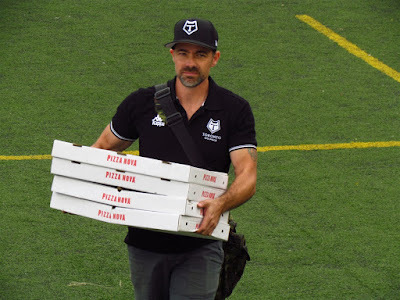 This afternoon the Toronto Wolfpack played their first game of the Kingstone Press League 1 Super 8s at home today against the Newcastle Thunder. There are 16 teams in the league and after they all play each other once, the top 8 play in what is called the Super 8s. The top team after that round is declared the champions and move up to the next level, the Championship league. 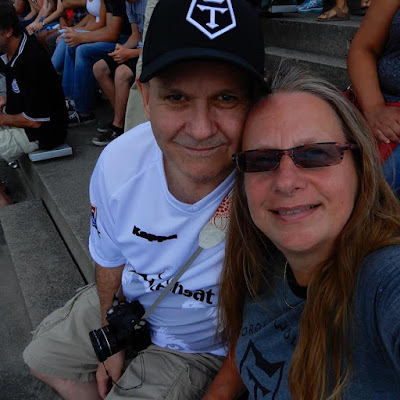 In the Super 8s, the Wolfpack played three games in a row in England then finish with four here in Toronto. They left England having won just one game, losing one and tied one. A win today was badly needed. The Wolfpack She-Wolves came out to rev up the crowd before the game. The National anthems are sung. At this time, most of the crowd was on our side of the stadium or in the craft beer garden. A breakaway. He was brought down before he scored. Here are me and Teena. We love going to the games! The Wolfpack make the tackle before they can score. There was a record 7,522 fans in attendance today. It's a loud, howling fun crowd. Wolfpack captain Craig Hall makes the 2 point kick after Toronto scored a try (4 points). The She-wolves at halftime. Toronto went into the dressing room with a 22-0 lead. Wolfpack are stopped near the goal line. The game ends and the teams shake each other hands. The She-wolves celebrate the win. The boys are hungry after a game. By the time they eat though, the pizza will be cold by the time they get to the dressing room to eat it as they all walk around the stadium shaking hands, signing autographs and getting selfies taken with the fans. One of my favorites, Jack Bussey. The craft beer garden also stays open for an hour or two after the game, so the party continues. It's always a fun time and Teena and I are looking forward to the next game on September 2 against Whitehaven. I appreciate how much you love what The Wolfpack brings to the sporting scene in Toronto. Wish I could be there, tho' I'd be making my way down to C'est Wha? This year's line up for the Toronto Wolfpack makes for a formidable team. Can't wait to see them in action this season in the Kingstone Press League.